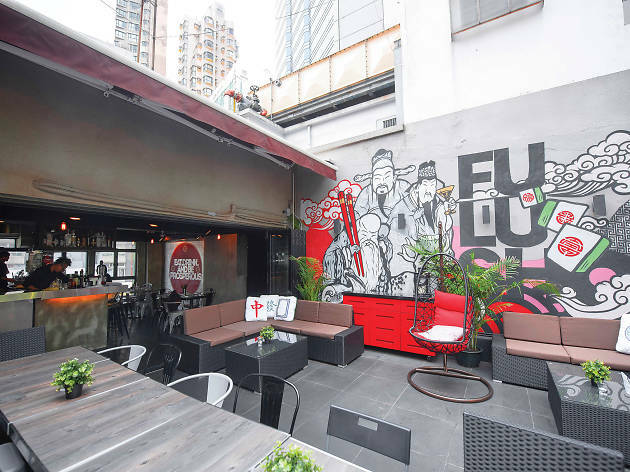 Retro Chinese-Western bar/restaurant Fu Lu Shou is here, and there’s no doubt or concern over what it is, and no ambiguity in its concept (unlike other so-called ‘casual rooftop bars’ that send you packing for scuffed shoes). Here they want you to be comfortable. Though don’t confuse this with some kind of 18-30 club resort bar with bottled mojitos and pre-mixed daiquiris. There’s more a sense of hidden gem here, tucked away unceremoniously on Hollywood Road among the myriad of other (though generally lesser) options without any signage, and requiring a door code to gain entry. Despite this, when we mosey in on a sticky Wednesday evening, the place is fairly bustling, not so much so that we can’t get a seat but enough to know that the secret’s clearly out. It’s easy to see why this place is already causing a lot of noise – the décor fits perfectly with the venue’s name, which means ‘happiness, prosperity and longevity’. It’s simple and effective, maintaining a balance of Chinatown aesthetics with Western accessibility. Simple but comfortable outdoor furniture and couches are over-looked by a huge mural, dominating the back wall that strikes as a kind of 70s Chinatown gangland tag, and fits the irreverent, fun setting. After settling in, we get down to business with Fu Lu Shou’s own take on the classic Dark n’ Stormy, the Typhoon 8 ($128). The balance is striking with the rum not being drowned out by an over-zealous application of lime or ginger beer. The Chrysantini ($118) is a delightful riff on the classic White Lady cocktail, with gin, homemade chrysanthemum syrup and egg white. It’s elegant, delicate and goes down far too easily. To finish, we go for the epically named Fuk Yu ($168), a wonderful marriage of Hennessy VSOP, bitters, maple syrup and chocolate. The rich textures complement each other beautifully without any one particular flavour strong-arming the others. It would be criminal to talk about Fu Lu Shou without mentioning the food, because it’s every bit as good as the drinks. Expats will look upon menu with glee as they see some of their favourites such as kung pao chicken and sweet and sour pork (both $138) among the plethora of recognisable delights. We try both and it’s like a taste of home perfected. The chicken is bursting with flavour without feeling too heavy or oily, while the pork dominates with a pleasingly tangy flavour. 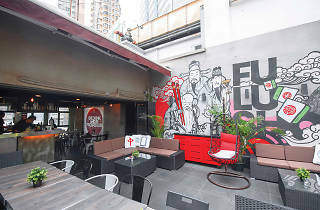 Fu Lu Shou is a venue that successfully bridges the drinking apartheid between the casual and quality. The retro Chinese influence is clear in its product and its Aussie heritage shines through in the top-class service. There's clearly a lot of love been put into this place and it deserves your attention.